RedHawk Linux Driver for PWM output PCIe card. RedHawk Linux Driver for PWM input PCIe card. Note: The CP-SENT-12 card supports TTL voltage levels only. External signal conditioning may be required for some applications. Includes DB25 male and female right angle terminal board assemblies with 6-foot cable. Provides screw terminal breakout for both input and output signals. Includes DB25 male and female right angle terminal board assemblies with DIN mounting and 6-foot cable. Provides screw terminal breakout for both input and output signals. Includes DB25 male and female right angle terminal board assemblies with 6-foot cable. Provides screw terminal breakout for input signals. Includes DB25 male and female right angle terminal board assemblies with DIN mounting and 6-foot cable. Provides screw terminal breakout for input signals. 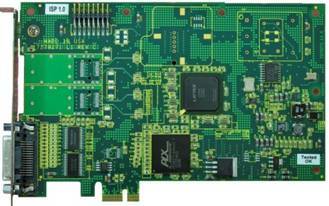 Includes DB25 male and female right angle terminal board assemblies with 6-foot cable. Provides screw terminal breakout for output signals. Includes DB25 male and female right angle terminal board assemblies with DIN mounting and 6-foot cable. Provides screw terminal breakout for output signals. 64-channel, 18-bit, high-performance 10-volt SAR PCIe analog input card up to 1.4 MSPS sample rate per channel. 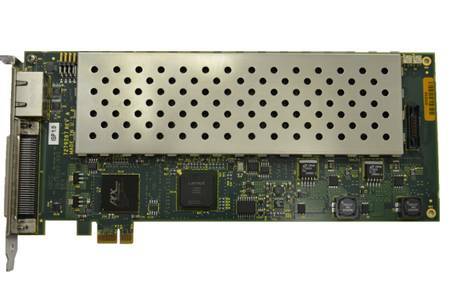 32-channel, 24-bit Delta-Sigma PCIe analog input card with up to 216 KSPS sample rate per channel. Single-ended 8-channel, 18-bit analog output PCIe card with 400K updates per second using LTC2758 dual channel DACs. Output range selection: 0 to +5V, +/-2.5, +/-5V or +/-10V . Industry standard SCSI 68-pin connector for outputs. RJ-12 (6-pin phone style) connectors for multi-board synchronization. Low-jitter phase lock loop (PLL) clock generator. Directly addressable conversion data registers. 128K word conversion data FIFO with DMA. Low noise analog power generation. Gain and offset calibration DACs per channel. Calibration ADC and source on board. Gain and offset calibration values accessible. Single-ended 32-channel, 18-bit analog output PCIe card with 400K updates per second using LTC2758 dual channel DACs. Differential 8-channel, 18-bit analog output PCIe card with 400K updates per second using LTC2758 dual channel DACs. Differential 32-channel, 18-bit analog output PCIe card with 400K updates per second using LTC2758 dual channel DACs. This package includes a library and test program that interface with the WC-DA3218 driver. The package provides a powerful and easy-to-use mechanism for users to generate continuous and unique user-supplied waveforms on any specified channel of a CP-DAx analog output card. Provides for recalibration of one Concurrent NIST-certified analog input or analog output card. Shipment of card(s) to the Concurrent factory is the responsibility of the customer. Return shipping is provided by Concurrent. Turnaround time is approximately four weeks. RedHawk Linux driver for 4-channel UEGO PCIe card. Transition value (64-bit long long) - Each bit represents the transition value for corresponding digital input channel. Time stamp value (64-bit long long) - Time stamp for corresponding transition value entry in the FIFO. The time stamp calculator is based on the card's 100 MHz clock and stores the tick count when a transition occurs. Data is recorded into the FIFO when any of the channels change their state or when the 64 bit counter rolls over. FPGA Workbench provides a complete development environment for building customized solutions based on Concurrent Real-Time programmable FPGA cards. FPGA Workbench includes a powerful GUI for selecting and configuring a wide range of pre-developed data acquisition and industry-specific modules to meet exact application requirements. The library of functional IP modules includes pulse width modulation, analog I/O, digital I/O, SENT protocol, encoder, ignition, injection, crank/cam shaft, wheel speed sensor and change-of-state. One FPGA Workbench license is required for each FPGA board. Concurrent Real-Time's programmable FPGA PCIe cards feature a powerful field programmable gate array that supports both digital and analog I/O. The cards can control up to 96 digital I/O signals along with 16 analog inputs and 16 analog outputs. Each card's I/O functionality is fully customizable by the user by means of the FPGA Workbench tools. The cards feature isolated I/O power, high-speed digital isolators and multi-board synchronization. Optional NIST traceable calibration is available for the analog section. The cards are available with 362K or 504K logic elements. FPGA Workbench requires Intel's Altera Quartus Prime Standard Edition for Aria V Development software package. The Altera tools make it easy to customize a card to meet specific I/O requirements. The tools allow users to develop and integrate their custom HDL code targeted for the Aria V FPGA on the Concurrent Real-time FPGA boards. Altera's Qsys tool eliminates manual system integration tasks and allows developers to focus on designing their desired custom I/O functionality. The Platform Designer (QSYS) system integration tool saves design time and improves productivity by automatically generating interconnect logic to connect intellectual property (IP) functions and subsystems. Prerequisites: Programmable FPGA card (CP-FPGA-x); Intel Altera Quartus tools (WU-ALT-DEV); one or more optional Functional Module Licenses (ICS-FPGA-20xx); a Windows or Linux system for FPGA Workbench client GUI; RedHawk Linux system for FPGA card target applications. Note: WU-ALT-DEV is Alteras Quartus FPGA development tool package. WU-ALT-DEV provides a renewable one-year license for customizing a Concurrent programmable FPGA card to meet exact I/O requirements. Alteras Quartus tool eliminates manual system integration tasks and allows you to focus on designing the custom I/O functionality you need. Compatible with Windows-based systems. Concurrent's CP-FPGA-2 programmable FPGA PCIe card features a powerful field-programmable gate array with 362K logic elements that supports both digital and analog I/O. The card can control up to 96 digital I/O signals along with 16 analog inputs and 16 analog outputs. The programmable FPGA card features isolated I/O power, high-speed digital isolators and multi-board synchronization. Optional NIST traceable calibration is available for the analog section. Prerequisites: WC-CP-FIO driver and WU8021-300 FPGA Workbench per-board license. Concurrent's CP-FPGA-3 programmable FPGA PCIe card features a powerful field-programmable gate array with 504K logic elements that supports both digital and analog I/O. The card can control up to 96 digital I/O signals along with 16 analog inputs and 16 analog outputs. The programmable FPGA card features isolated I/O power, high-speed digital isolators and multi-board synchronization. Optional NIST traceable calibration is available for the analog section. The following standard, pre-developed functional modules can be configured on a Concurrent FPGA card as needed by customer applications. There is a 32 channels limit for each IP core unless specified otherwise. Note: All FPGA card configurations, including functional module types and quantities, must be reviewed by the home office prior to quotation. The Analog Output IP core enables you to connect to each of the 16, 16-bit analog output channels on the board. The board supports both single-ended and differential outputs. The outputs can be software configured as 16-channel single-ended outputs, 8-channel differential outputs, or a combination of single-ended and differential controlled in banks of 4. The Analog Input IP core enables you to connect to each of the 16, 16-bit analog input channels on the board. The board supports both single ended and differential inputs. The ADCs are arranged and controlled in banks of 8.. The Digital IO IP core enables you to connect to each of the 96 DIO channels on the board. The channel direction is software controlled in banks of 4. The User Module IP core provides a black box interface for custom user Verilog code into the FPGAWB framework. The IP core enables the users to import the top level Verilog file for the user module. The top level file should be based on the template User Module so that the interface is consistent to Intel QSYS/Platform Designer. The User Module can be accessed thru memory read and write API calls. Only one instance of the User Module IP is allowed in one project. The Ignition/Injection IP core captures pulses coming from the ECU. The information (start CA, stop CA, pulse width etc.) captured is relative to the configured TDC of the cylinder. The Ignition/Injection IPIP can handle both injection and ignition digital inputs. The Crank/Cam IP is a prerequisite for using the Ignition/Injection IP. Transition value (32-bit long long) - Each bit represents the transition value for corresponding digital input channel. Time stamp value (64-bit long long) - Time stamp for corresponding transition value entry in the FIFO. The time stamp calculator is based on the card's 100 MHz clock. Data is recorded into the FIFO when any of the channels change their state or when the counter rolls over. The Angular Encoder IP core module is a generic encoder that can generate linear, angular, or quadrature encoder waveform outputs. These outputs can have standard fixed pulse width or programmable pulse width. The Angular Decoder IP core module takes A, B and Z input from an angular encoder and will output X1, X2 and X4 counter values. X1, X2 and X4 count the edges of the A and B input waveforms to estimate the current angle. This module can use the Z input to reset the counter to signify a 360 degree rotation. For custom waveform output or file driver waveform, please use the User Module IP core. The High Pressure Fuel Pump (HPFP) IP core captures pulses coming from the ECU. The information (start CA and stop CA) is captured for each channel. The Crank/Cam IP is a prerequisite for using the HPFP IP. 1-meter SCSI-5 (VHDCI) to SCSI-3 Cable - VHDCI .8mm 68-pin Male to HPDB68 (HD68) 68-pin Male. Note: Four cables are required to utilize all board functionality on CP-MFIO, CP-ENG-SIM and CP-FPGA-x; two cables are recommended to utilize all functionality on CP-ADS6418 and CP-COS-64. 2-meter SCSI-5 (VHDCI) to SCSI-3 Cable - VHDCI .8mm 68-pin Male to HPDB68 (HD68) 68-pin Male. Note: Four cables are required to utilize all board functionality on CP-MFIO, CP-ENG-SIM and CP-FPGA-x; two cables are recommended to utilize all functionality on CP-ADS6418 and CP-COS-64. 3-meter SCSI-5 (VHDCI) to SCSI-3 Cable - VHDCI .8mm 68-pin Male to HPDB68 (HD68) 68-pin Male. Note: Four cables are required to utilize all board functionality on CP-MFIO, CP-ENG-SIM and CP-FPGA-x; two cables are recommended to utilize all functionality on CP-ADS6418 and CP-COS-64..
I/O screw terminal breakout module for analog and digital I/O. Requires interface cable. Note: One breakout module required per cable..
2-channel PCIe x1 CAN bus interface compliant with ISO 11898-2. Electrically isolated. Supports bit rates up to 1 Mbits/sec bus. Supports bus mastering and local data management by FPGA, and selectable CAN termination on-board. Provides two DSUB-9 male connectors. Prerequisites: WC-CAN-402 RedHawk Linux Driver. RedHawk Linux driver for CP-CAN-402-x CAN bus card.